Get ready for some very purple pictures. We had a lovely weekend in Kansas and went on a whirlwind tour of most of the major cities. 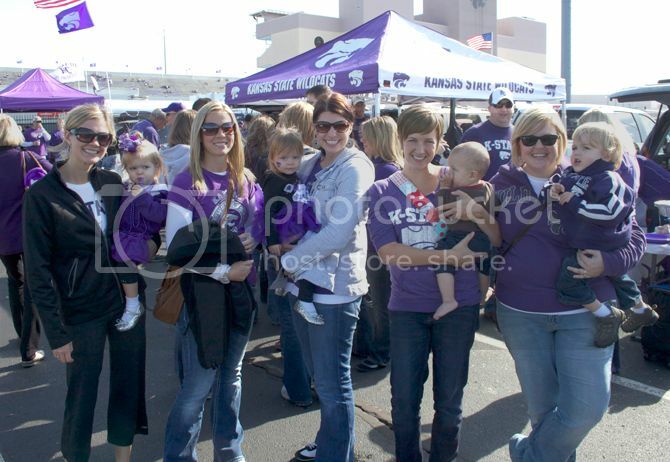 We ended up in Manhattan Saturday for the big K-State game--we didn't manage to make it to the end, so I'm not sure whether we won or lost. 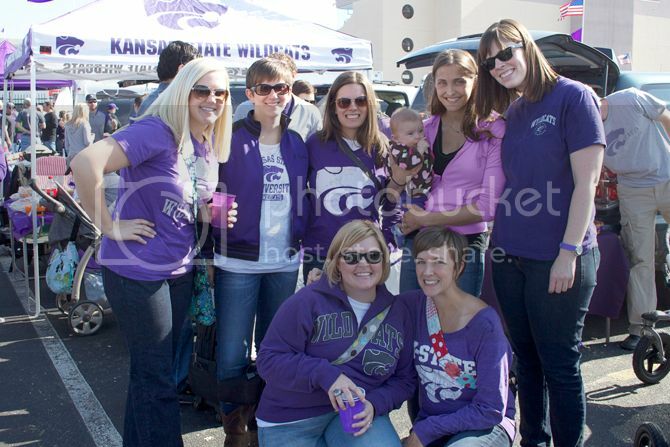 The boys were great--they hung out with us in the stands until we headed out in the middle of the fourth quarter. Braden napped in my arms for a bit and Finley played under the bleachers. Weird. Finley was thrilled to be at the game. He loved seeing all the powercats and got so excited every time he saw one (which was often!) 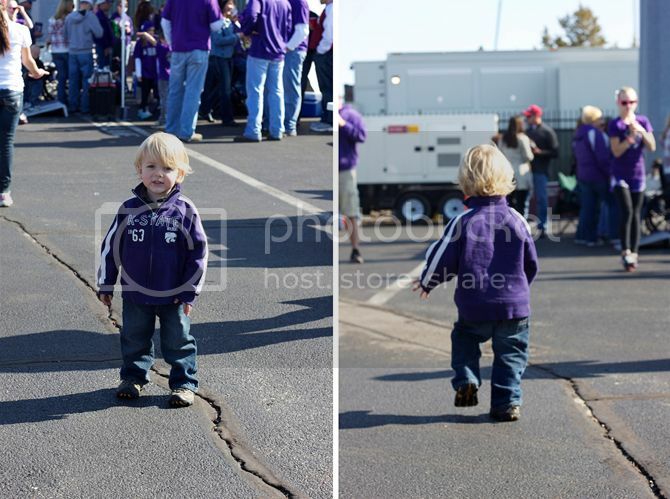 He also frequently commented on his K-State shirt, and mama's K-State and Daddy's K-State shirt... but not Braden's, because Braden had the messiest poop I've ever seen as we pulled into the stadium. Poop to his ankles. GROSS. And here are the boys with TORI! Don't they look thrilled? Um, yeah... in addition to never posting the story of the day my little guy was born, I've never posted about his nursery (thanks for reminding me, Kat!) It's pretty much in it's final state now, so it's as good as time as any to post about it! 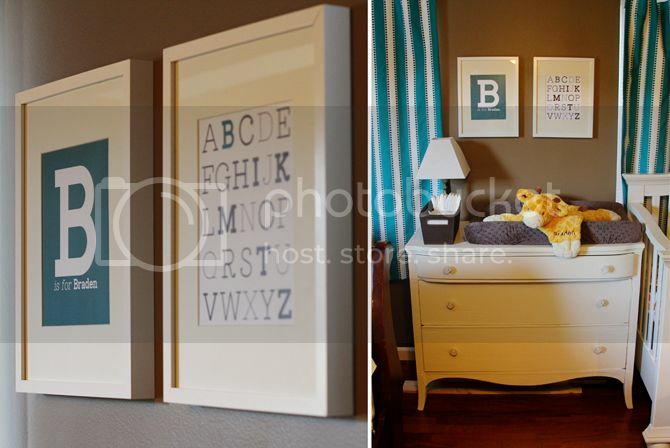 The pictures are from various points over the seven months I've been working on the nursery, so it may be a little confusing, but you can deal with it. Also, I really struggled with the lighting, so you can pretend there isn't a weird glowing window below and that the colors look a little more normal. The nursery's theme started off being "look at this cute fabric I found!" but has slowly turned into giraffes and orange and teal. Weird. Pretty much everything made from fabric I sewed myself--from the crib sheets to the bunting above the bed. I ordered all the flannel from flannelqueen.com and the curtains and bow pillows were made with some awesome fabric from fabric.com. Love ordering from them. 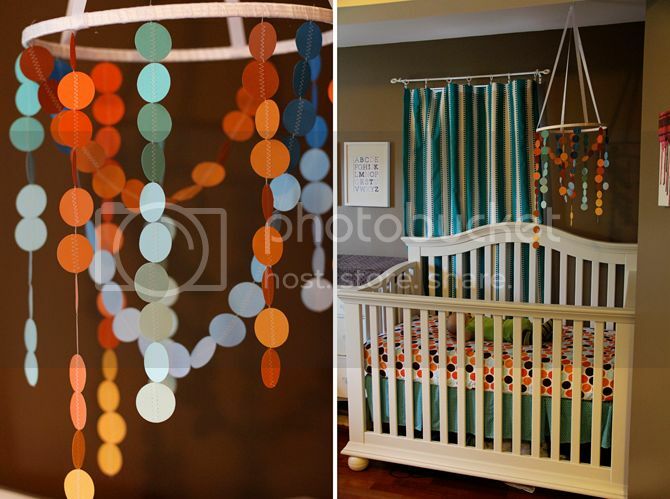 I made this rather silly mobile above his crib using a circle punch and my sewing machine. It was a LOT quicker than I thought it would be, and I think it's super cute. Wall art was inspired by an Etsy shop I found and replicated by me. Imitation is the sincerest form of flattery, right? Isn't that what the internet is for? Finding cute ideas and making them on your own? The changing table was Craigslisted... along with every single piece of furniture in our house. Seriously. I did NOT make this giraffe print--I bought it on Etsy and it shipped from France! C'est la vie! Monsieur! Shake your bon bon! 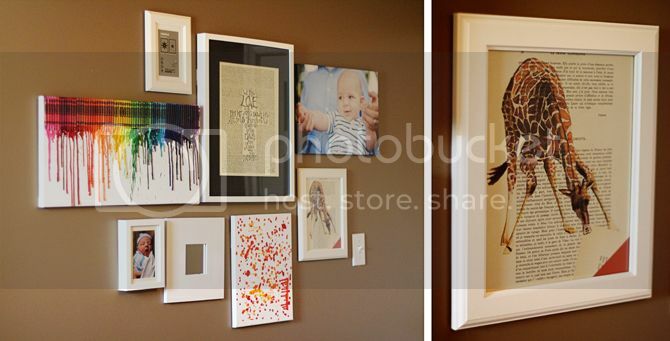 I did make the crayon art on the left, as well as the weird crayon art on the bottom. I know. It's strange. The cross print in the middle was a wedding gift from Sol's dear friend Luke, who Mr. Braden Luke is named for. And the empty frame is to remind me that my work is never done. And that's the nursery. It's almost as cute as the little boy who sleeps there. I thought it was a really great idea. Braden did not. Finley isn't really into holding Braden--but he does like playing in the crib with him after his nap. I love this series of shots of the two of them. 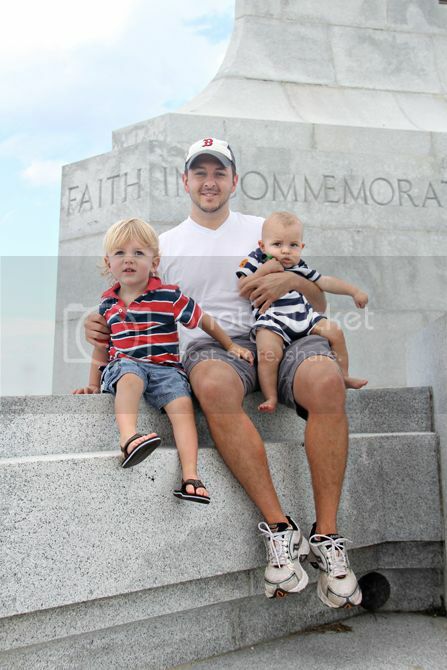 Even though Braden looks as big as Finley, I promise he's still littler. (Is littler a word?) I can't believe Finley's already trying to keep cars out of Braden's reach. Oh boy. 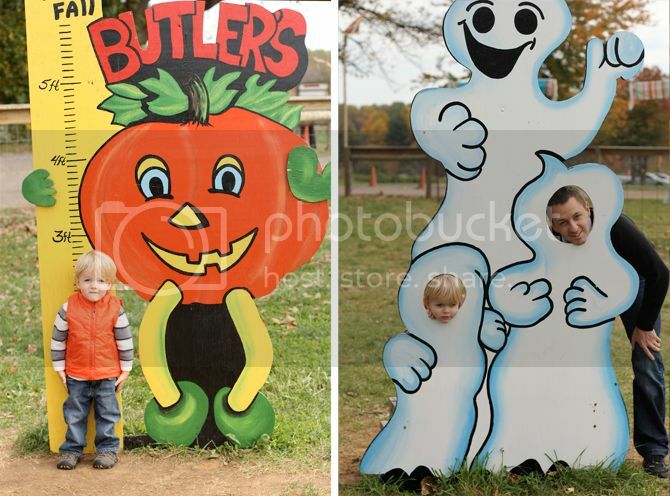 It's become a bit of a tradition to go to Butler's Orchard for our annual pumpkin picking. This is my third year to go (first year, second year), but my first time to go sans Vic. TEARS. This was Em and I's third year to go together, but her first year as a married lady! Yay EM! 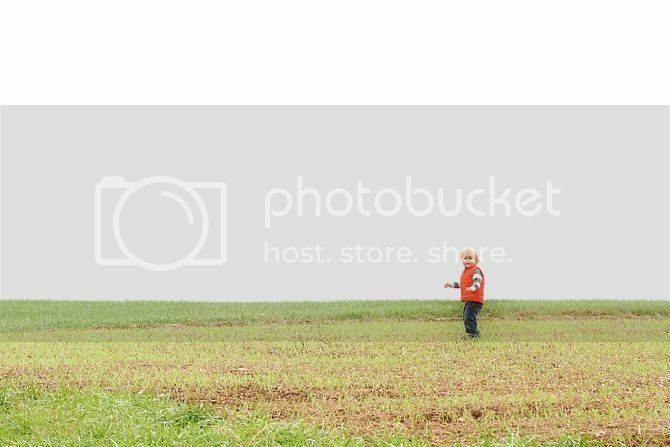 It's a picturesque little orchard in Maryland with lots of fun stuff for kids. 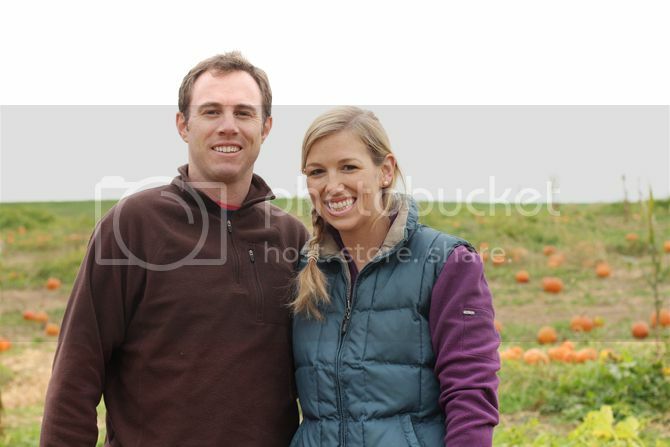 You get to take a hayride to what we thought was a very authentic pumpkin patch. Until we found a sticker on a pumpkin proudly telling us it was from Pennsylvania. Fail. 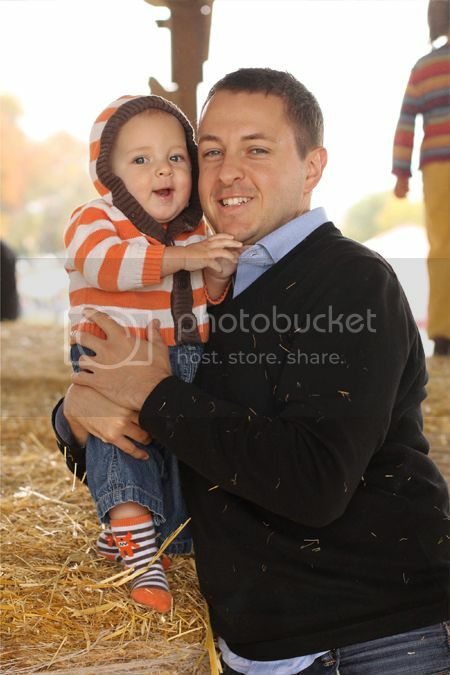 Finley walked around saying, "I love pumpkins" until he decided to run off into another non-pumpkin field. 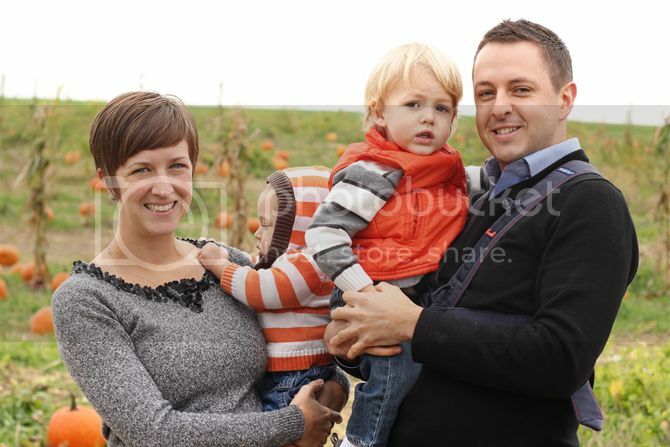 Fall family picture. 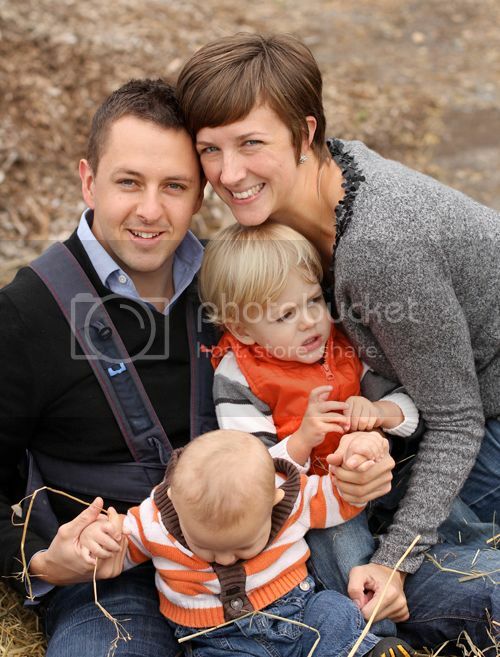 It would not be complete without someone wearing the Baby Bjorn and someone not looking at the camera. You can't tell, but we are on a hayride here. That's why Finley's face is so full of JOY. Finley got to experience his first pony ride. 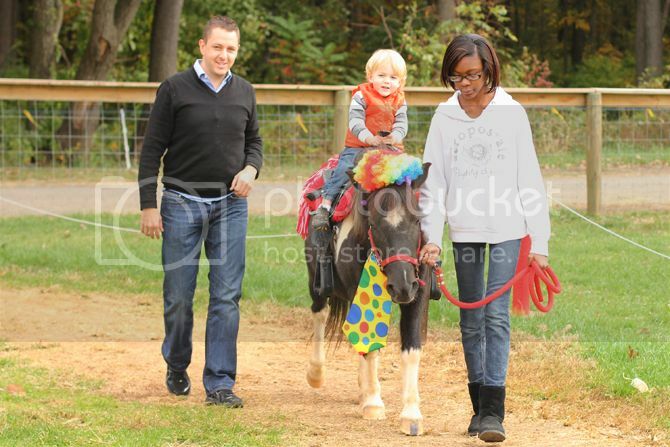 I don't think he noticed that the pony was dressed up like a clown. He did seem quite confident in the saddle--a future equestrian, perhaps? We also got to see how tall short he is. And what he would look like as a ghost. 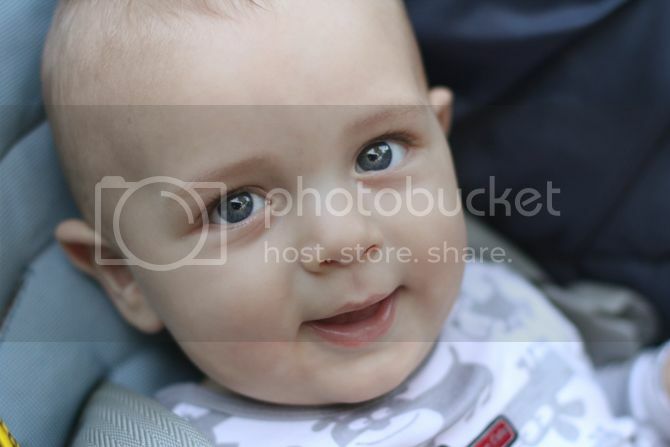 Braden was just happy that someone was carrying him around. Finley really liked to jump and throw the hay. He was a little less thrilled about it being in his socks and clothes. And that, my friends, was the pumpkin patch. It was all we could have hoped for. We came home with lots of pumpkins, pumpkin pie and a delicious pumpkin roll. And then we took naps. THE END. Well, I'm straight up obsessed with this picture. My friend Kate snapped this picture on her iPhone of our kids playing--my two boys and her two girls. It's really perfect. Their tiny hands. The way they look like they are plotting against us. Or maybe that Finley is telling a funny joke. The sweet book in the background. And the ruffles on Abby's tush. LOVE. Today I decided to go to the gym and take the kids to the gym childcare. For the first time since Braden was born. Ambitious! It's a little rainy today and I felt like swimming instead of running. I talked it up on the way there and got Finley pretty excited. Unfortunately, when we got there, the childcare was closing. Apparently I should have check the childcare hours.... whoops. So instead of working out, we went and had Chipotle. Yes, I realize Chipotle is pretty much the opposite of exercise. 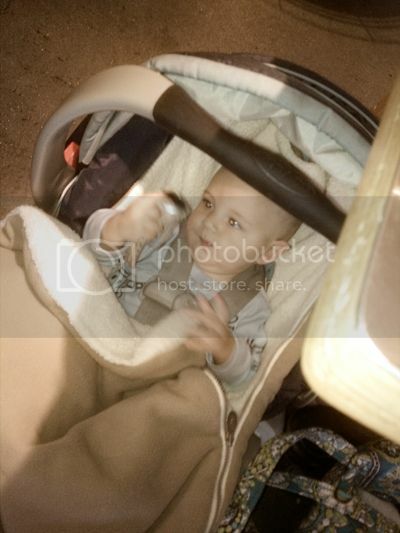 I moved my car to the other parking garage and lugged the car seat and Finley though the lot. We stood in line and ordered our tacos. Finley was so good and Braden sweetly made googly eyes at the ladies behind us. As I was paying, one of the ladies told me I had beautiful boys. I puffed up with pride a little and told her thank you. We made small talk about having boys and then she offered to help me carry my tray to my table. And I hesitated a little--I really didn't want help. I'm not sure how I was planning to get a two year old, a carseat and a tray of food over to a table. Not to mention finding a high chair and (the horror!) filling my own drink. Even though I didn't want to, I graciously accepted the sweet lady's offer to carry my tray... and then fill my drink... and get us utensils. Why was that so hard for me? Just last night Vic and I were talking about accepting help--and how hard it is to ask for help and accept help when it's offered. When we went to Whole Foods yesterday, I finally accepted the checker's offer to help me to my car--I have no idea why I always refuse to let them help me. It's like I think I'm on some hidden camera show and I'm going to win an award for multitasking. Um, no Rachel, let the nice people help you. Public confession time: I can't do it all by myself. I'm so glad I let her help us--I'm glad she had the opportunity to bless us, and that I was able to allow ourselves to be blessed by her help. 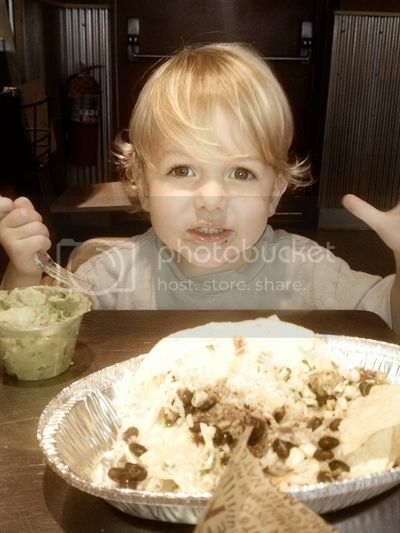 A little humbled and very grateful, Finley and I enjoyed our tacos. And Braden, the sweetest most patient baby that I've ever birthed, sat under the table and played with the only toy I had for him, my running watch. Moral of the story: let people help you. Everybody wins. Do you like that pun I made? I'm hilarious. 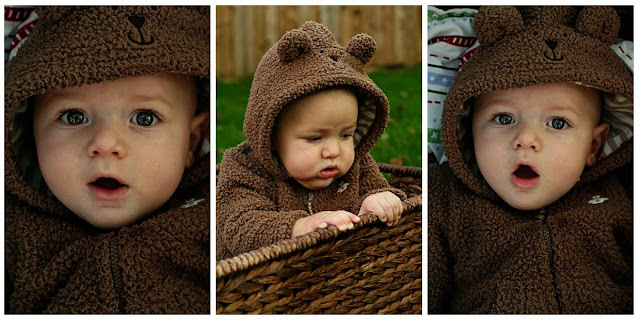 Back when little Finley was six months old, I stuck him in this same outfit and in this same basket and made him take these same pictures. What's the point in having two boys if you don't make them wear the same clothes and do the same things. There's no point. I actually didn't do any sun flare ones two years ago because I had no idea how to use my camera. And now I have like three ideas about how to use my camera. 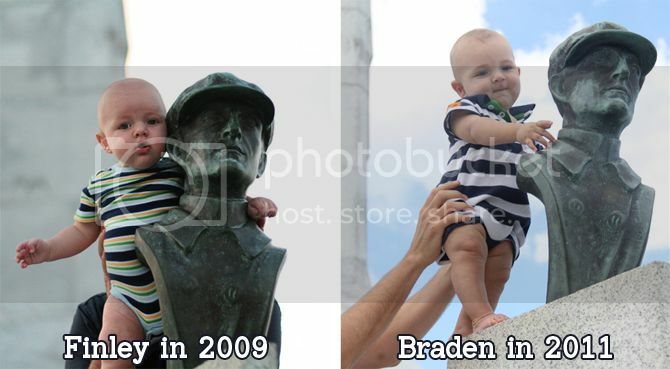 Braden still wasn't too interested in smiling at me, much like his brother two years ago. But he's forgiven, based on him being adorable. 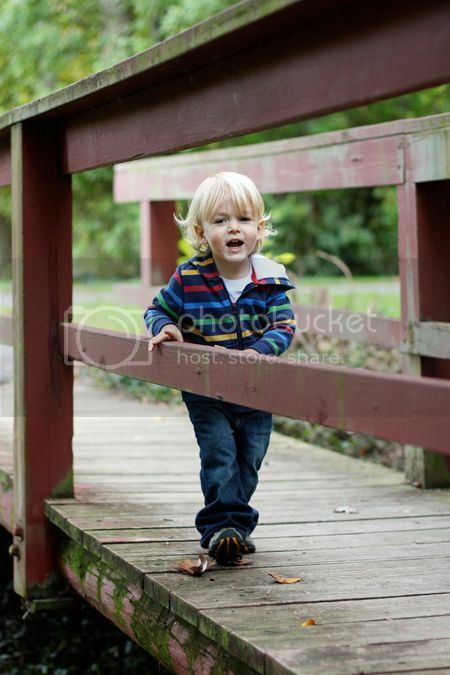 I'm loving the fall weather and getting to get out a new set of warm clothes for the boys. Jackets! 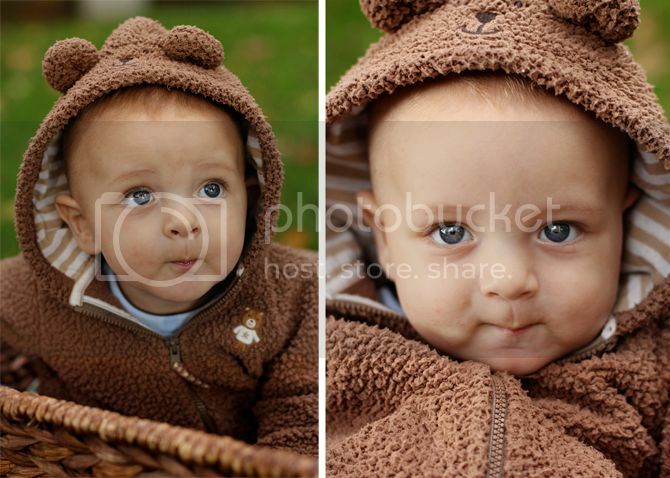 And just for comparison's sake, here's little chubby Finley at six months. Braden's had a rough couple weeks--ending in his six month check up where he had lost half almost a pound in a week. :( He has a pesky rash on his scalp that keeps popping up. On his third round of antibiotics he started sleeping through the night because his tummy was so upset he didn't want to eat. This led to the weight loss and a VERY hungry baby this week. Seriously, hungry all the time. We're meeting with a dermatologist next week, so hopefully they will give us some answers then. 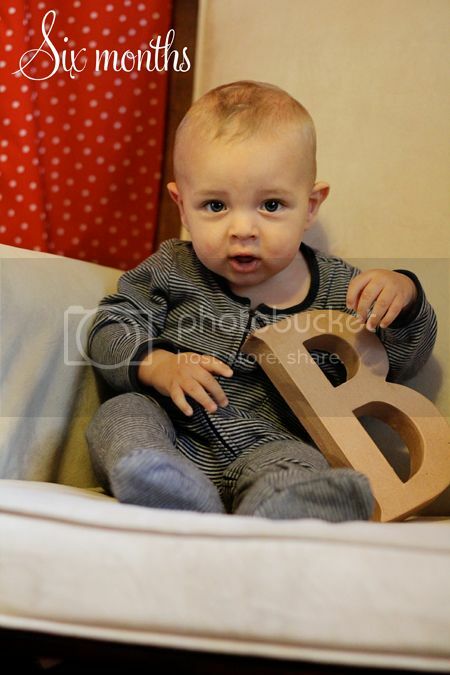 Braden's just starting to be slightly stable sitting up--he's still not very good at it, but he's practicing. No crawling yet, but he occasionally gets up on all fours. Also, no teeth. I'm grateful for this. 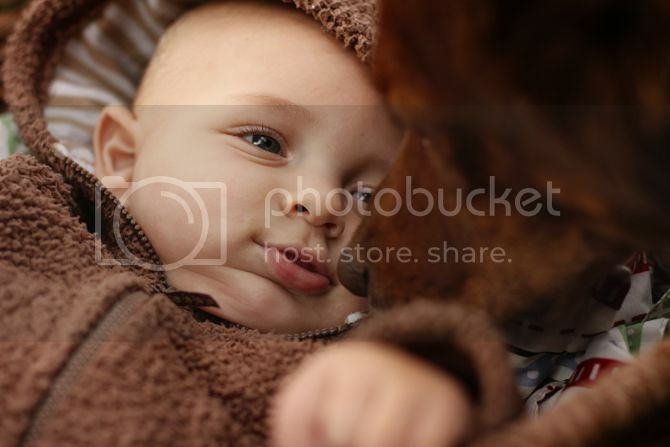 Finley is his favorite thing to look at--he smiles and giggles like crazy at that boy. He's totally serious about sucking his thumb and is just delightful to be around. He (normally) wakes up around 3 to eat, and sleeps from about 8 to 8:30. I like it. He takes 3 naps most days. And he's cute. 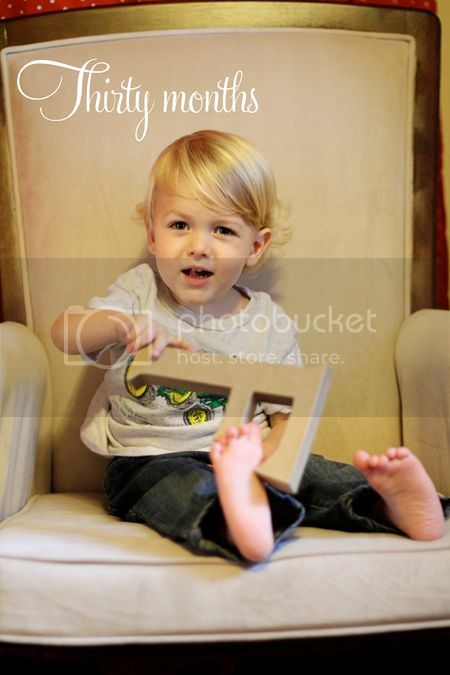 Finley is two and a half. Can you believe it? You should because it's true. 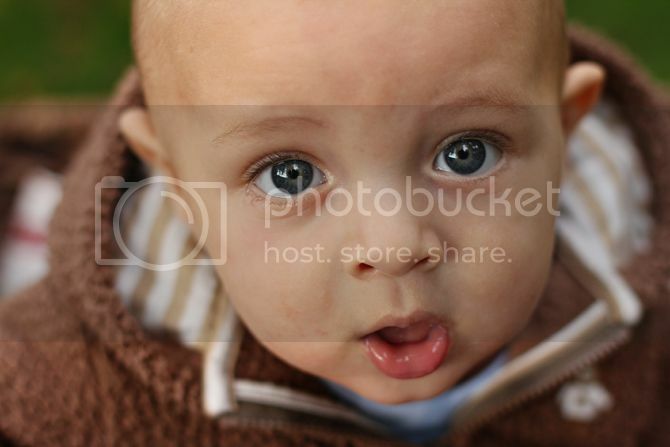 He's doing awesome with the potty training--exceeding my expectations all the time. He's a great talker and, just like Braden, is delightful. I love to listen to him play and talk to himself--he just cracks me up. He's just about got his pronouns straightened out and he loves to practice them all the time. I listened to the Wicked soundtrack today on my run and these lyrics sum up how I feel: "We couldn't be happier, because happy is what happens when all your dreams come true. Isn't it?" And while all our dreams haven't come true (I don't have a hundred babies, I haven't qualified for Boston, and Arrested Development hasn't actually started filming yet...), life is pretty good around here. We really couldn't be happier. 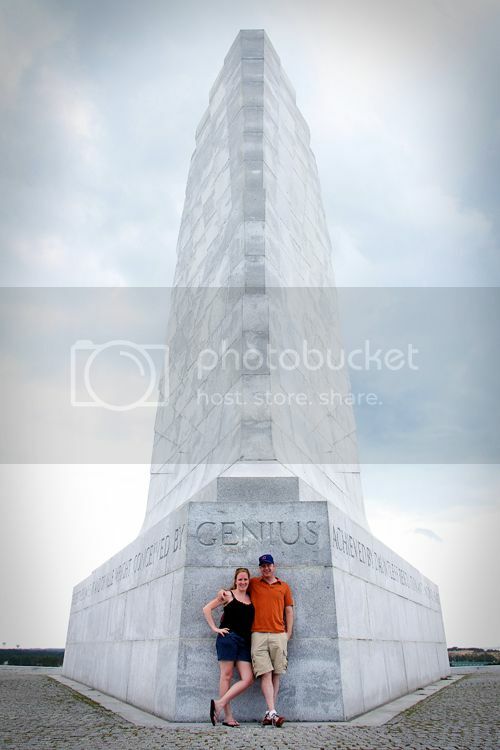 One of my favorite things about the Outer Banks is the Wright Brothers Memorial. My family lived in Dayton, OH for many years--the home of the Wright Brothers. 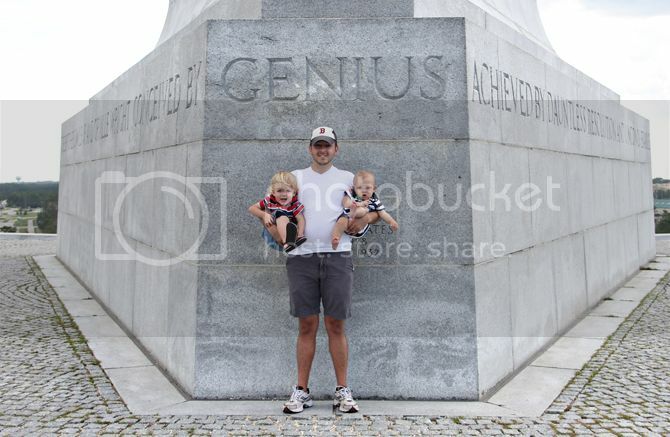 The brothers took there first flight at Kitty Hawk on the Outer Banks--and this memorial We had a lot of fun taking pictures there two years ago, and I was excited to recreate a few of them. 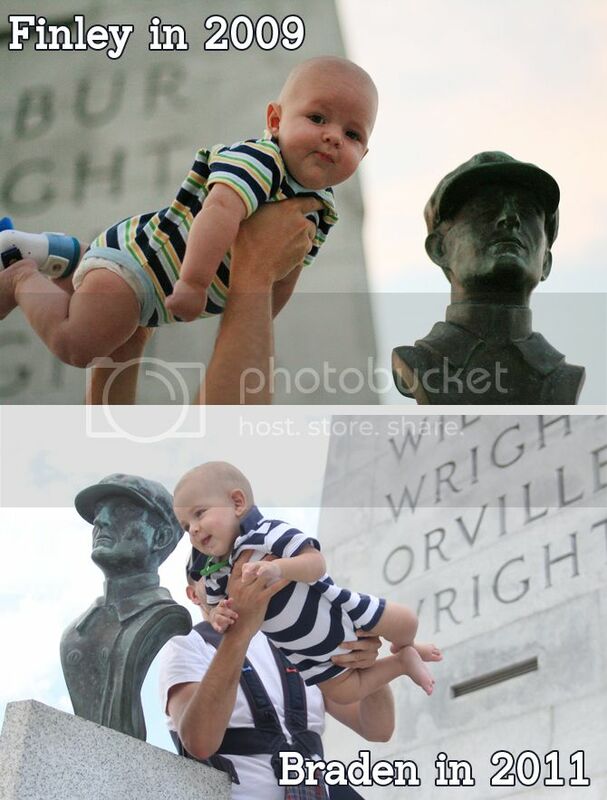 The Wright Brothers and my two babies--they do look like brothers, huh? One of the things I didn't catch during our first visit was the quote around the memorial--it had a few words that made great photo opportunities. 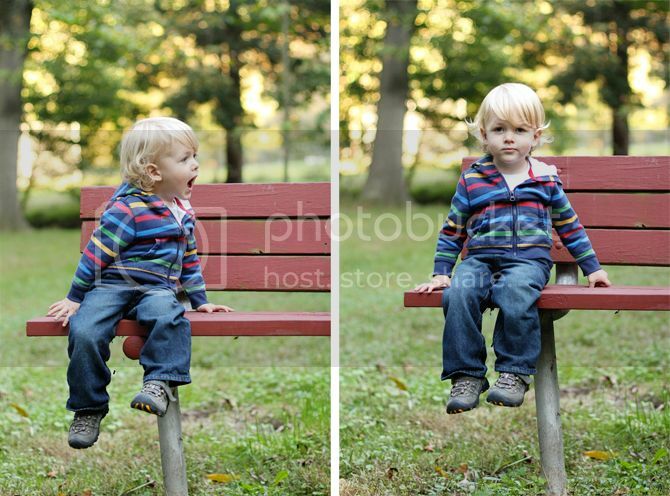 (See my awesomely clever photo collage here.) Yes, these three are geniuses. And two of these are brothers. And this is my favorite picture from the outing--my sister and her boyfriend. 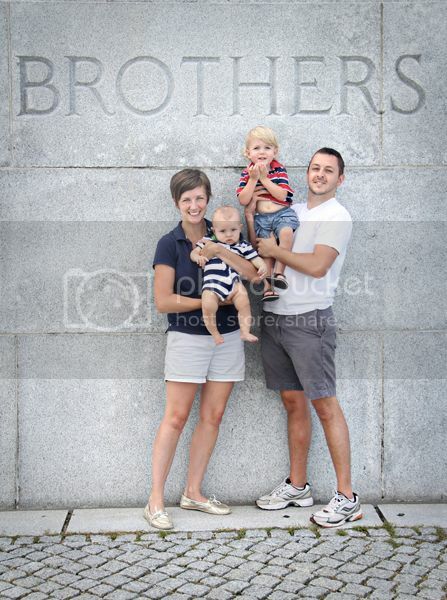 We were so glad they were able to make the trip with us! Lucky, lucky me got to meet tiny little Gwen on Saturday. She is just under five pounds--although she doesn't look it in the pictures. I was her first visitor and saw her right before she turned 12 hours old--what an honor! Can you believe it? I just can't believe babies are ever so new and little. She sounded like a little kitten when she cried, she's just so small and sweet. 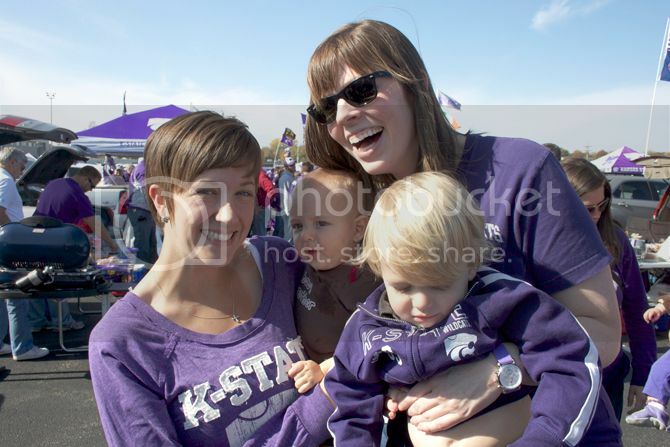 I know Vicki from my days as an Alpha Chi at K-State, so it was really important to make sure Gwen got some pictures in her first purple outfit--even if it was huge. 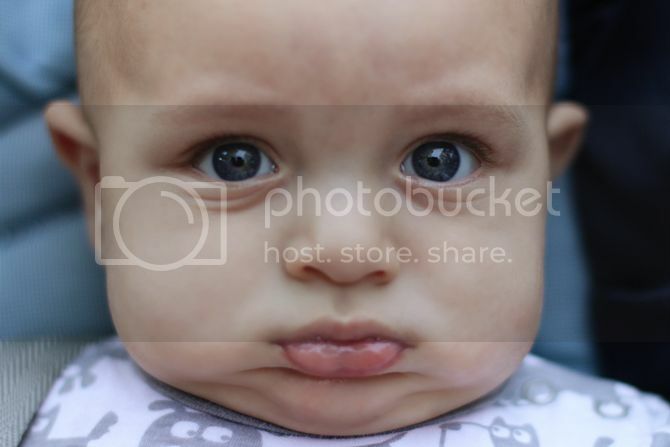 And this is why I can't be around little newborn babies. Because they have tiny fingers and soft, soft skin. 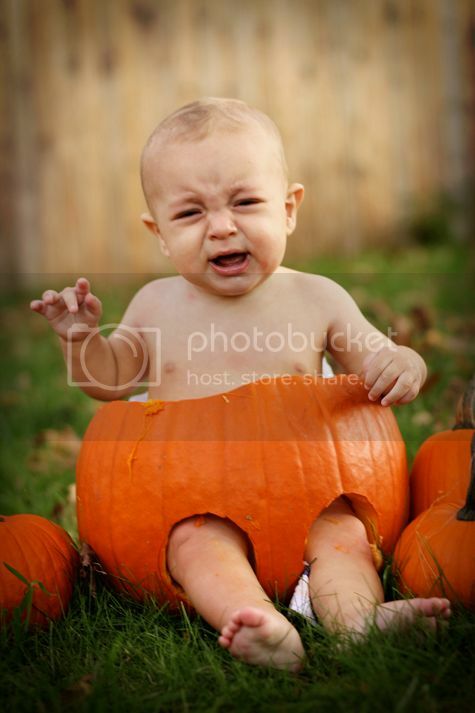 Is it bad that my favorite newborn pictures are the ones where they are screaming? Those little angry faces always make me laugh. Why are you so mad, little person? I love little Gwen. And my fingers are crossed that her mommy sets up a blog soon so I can see her sweet face all the time when they move away from me in a few months. Stay tuned for more Gwen soon... I'm headed over to take some more pictures of her some time this week. 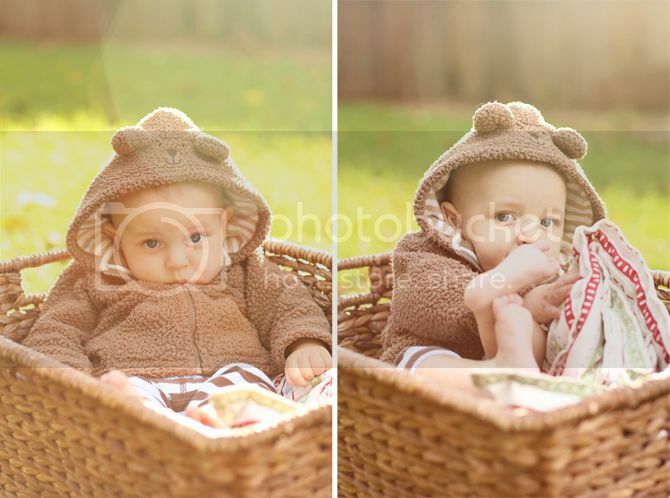 Because there's no such thing as too many pictures of your baby. And don't you forget it. I'm supposed to take some pictures of my pal Vicki tomorrow. She's currently 37 weeks pregnant. We were planning on taking them in this park by my house. It has a nice red bench for pregnant ladies. And even though this guy looks chubby, Vicki was going to look svelte and preggy. She was even going to run across this bridge! But instead of taking pictures of her belly tomorrow, I'm hoping I'll get to take pictures of her BABY GIRL! Vicki is currently in labor and sent me a message saying she needed a blog post to read because she's "bored". Really, Vicki? Labor is BORING? Vicki--I can't wait to meet little Rachel. That's her name, right?